Long-time Bilgemunky Radio supporters Captain Mal and Mac the Wife sent this piece of extraordinary pirateyness shortly after the 100th Podcast with an accompanying letter of congrats. Its eyes have a habit of following you, and at night it whispers secrets. 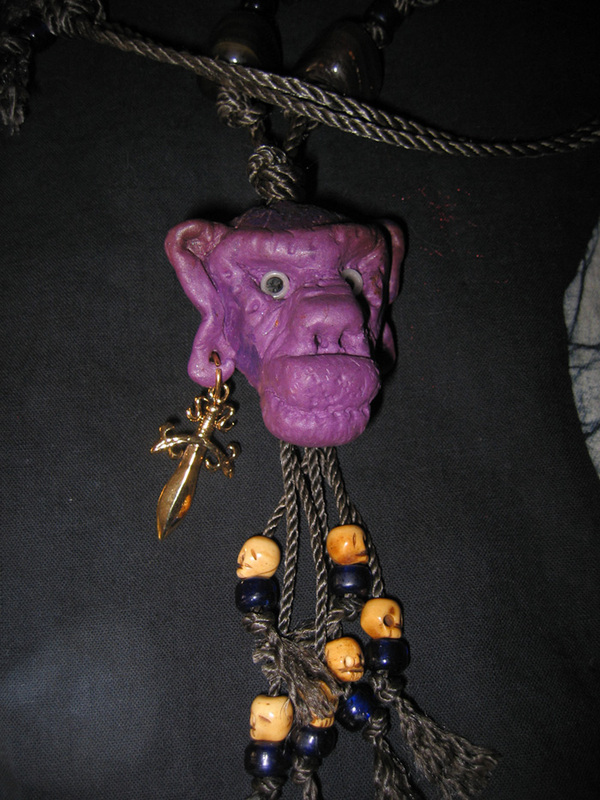 I’d say more about this handcrafted monkey head, but really, it speaks for itself. See? You see what your fans did for you? They charred big hunks of wood ‘n carved your visage in ’em! They sculpted your cranium outter naught but clay, festooned with genuine bone-carved skulls! If I was you, sir, I’d not take such gifts so lightly, and turn my ENTIRE 100th podcast into ONE BIG PRANK ON THE AUDIENCE! …Deep breaths, Lefty, deep breaths. Happy 100th, and here’s to many more! Why how lovely! You must be very touched at such a thoughtful gift! I think everyone should have a disturbingly scary monkey head, don’t you? Happy 100th!!! !